It's common to describe mathematics as a formal, meaningless game with abstract symbols (often in the wake of Bertrand Russell's observation). Mathematicians, of course, know better. They know that mathematical language is a tool so powerful that it lets them imagine unimaginable. Symbols are invented for a purpose, to a great extent with an objective to make mathematical concepts easier to handle. Who then, if not a working mathematician, may more convincingly weigh to rectify the popular delusion. Richard Evan Schwartz - the Chancellor's Professor of Mathematics at Brown University - does this with exceptional flair, in a clear and entertaining manner. The book is about the most basic mathematical concepts - that of counting and numeration. Indeed, there would not be big numbers if there were no small ones. So this is where the book starts - with small numbers. With wonderful illustrations, Schwartz makes it clear that the same number describes a property of various sets, regardless of how the elements of those sets are arranged or grouped. Next, grouping elements by 10s and 100s the book leads fast to bigger numbers. But on the way up there the book dwells on origins of big numbers, with such hands-on and humorous examples as the number of minutes in a week or the number of hours lived by a 114 year old fellow. Big numbers arise in trying to describe the number of ways to paint a 3x3 board or to place checkers on the chess board, the number of feet on the way to reach a satellite, the number of basketballs to cover New York city to the height of a reasonably tall man. Then exponentiation is introduced and the exposition accelerates, though not before the powers of ten through quinquagintillion (which is 10153) are listed and named. And then come the googol and googolplex, followed by other plexes - the staired exponentiation and, eventually, pictorial but nameless representations of stupefyingly enormous quantities. The latter illustrate another important concept - that of recursion. The glyphs - squares in squares, triangle in pentagons, etc ... - have no names, but their meanings are absolutely transparent due to the recursive definition and, if nothing else, demonstrate convincingly the expressive power and adaptability of the mathematical language. ... to read all at once, or even all in one year. Just read as far as it makes sense and then save the parts you don't understand for later. Many will probably take the author up on that advice and put the book aside. Those that persevere are bound to have their imagination fired up as they follow the book's lead to the literally unspeakable quantities mathematics lets them deal with. 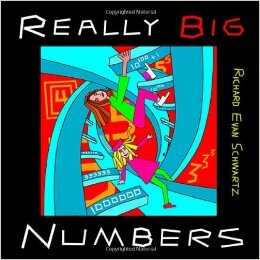 Really Big Numbers, by Richard Evan Schwartz. AMS, 2014. Softcover, 192 pp, $25.00. ISBN 978-1470414252.